Continental Drift: Trace the Continental Drift! As I have just recently read in the German version of the Scientific American - Spektrum der Wissenschaften - scientists have known for long that the sun's photosphere rotates faster at the equator than at the poles. Now here is a theory I have been working on as a hobby for the last 10 to 15 years, since around 1982: That this is a common trait of all rotating stellar objects which are able to do so, be they liquid or gaseous, big or small, from galaxies over stars and planetary systems down to the planets themselves. I came across this idea by looking at a map of our own planet and trying to trace the continental drift by retracing the spreading zones on the earth's surface as shown on the globe. One of these strange facts, is that there are no mountain ranges on either side of the Atlantic or Africa or to the south of India, where in plate tectonics theory they should be, opposing the mid-ocean ridges. Obviously, no tectonic subduction has taken place to the south of India or west of Africa and Europe and east of the Americas during the last few hundred million years; this concentrates itself to the north of India and in the east of the Pacific, on the west coast of the American continents, and north of the Mediterranean Sea. By retracing the sea floor spreading and running it forward again, the startling effect is therefore a clear eastward flow of the continents along the equator, with a circular hole at the north pole ( more continental mass being in the northern hemisphere ) and a circular land mass at the south pole. The usual animation, exploding Pangea in all directions from Africa, is probably due to our Euro- and therefore, Africa- centered view onto the globe. My idea now is that the continents are being carried along by an eastward equatorial stream in the earth's mantle, driven by the earth's core rotating faster than the surface. and bursting out toward the southeast, opening the Pacific to form the North and South America's western mountain ranges. Weirdly, this assumed magma flow seems to follow the projection of an "ecliptic" ( i. e. the position of the noonday sun ) onto the planet in exaggeration; which may, if so, be a result of the sun's gravitational pull combined with centrifugal forces, causing it to meander in the described fashion. [ This gravitational pull of the sun, together with that of the moon and the rest of the solar system, may even contribute to the effect of slowing down - or rather, holding back - the outer shell of the earth. Why so many continental fractals are triangular with a tip to the south, I have no idea, but there must be a mathematical reason for this. Could this have some connection with the three branches of the alpide mountain chain / trench systems with their vortexes north of Australia and the under the Indian Ocean, respectively? And maybe even with the seemingly likewise threefold ridge-and-valley system on the outer core ( the "Vogel-Bumps" ) as proposed by Prof. Dr. Vogel of the Free University, Berlin? Or is it just purely mathematical? Is it just my preconceived impression, or do series of tremors sometimes seem to run around the world from west to east? This, if born out by data, might help to forecast earthquakes, if one knows the spots to be monitored closely. It's just an ideé fixe. The rather simple trick is to reduce bit by bit the sea floor spreading in relation to the mid-ocean ridges. Wherever there is a rift or basin, close this by x on each side. Open corresponding trenches and spread corresponding mountain ranges accordingly. Repeat this procedure step by step until all recent rifts and basins are closed. This only works if the Alpine - Andean mountains (which by now have lost most of their volume due to erosion) are allowed to spread out in consequence, and the continents themselves are allowed to deform - or rather reform - in the process, since the mountain ranges of the Alps, once a series of marine sediment basins, for instance, in part now lie hundreds of kilometers "inland" from their original location. Here, plausible assumptions have to be made. Who says the continents have always had the same shape as today? Neev and Hall (3) of Israel did some research on this aspect many years ago but, as far as I know, have met with very little response. Here, inevitably, plausible assumptions will have to are made about the original expansion of the so treated compression zones; whether they once represented sinks, possibly submarine, and the like. However, the outcome of this drift - retracing (an oblong-shaped Pangea, which extends over both poles), is less arbitrary than it may appear at first glance. This roughly corresponds with the present-day scientific image, but shows the way to get there - and thus a way to extrapolate this into the future. and finally, Miami, Monterey and Dakar, Boston and Lisbon, Rio de Janeiro and Luanda. The Cape of Good Hope and Cape Horn were one, but no cape. The Drake Street was closed by Antarctica. All island chains to the east of the continents were once eastern coastal regions of these continents, torn away by the eastern magma flow postulated by me. There are NO island chains ( or basins, for that matter ) to the west of continental shelves! This observation cannot be sufficiently stressed. Just as there are no real subduction zones or consequent mountain chains on the eastern regions of the continents. Mountain chains in the eastern regions of continents, as in North and South America, or Asia and Australia, are not subductive, but former rift rims; they always ( ! ) have their counterpart further east across the ocean, symmetrically divided by a mid - ocean ridge or basin. This process can be seen developing in the East African Rift Valley. Some of these counterparts have, indeed, turned into the above mentioned island chains. The Indonesian island chain down to the island of Bali, for example, which seems to be in the west of the Australian Continent, apart from being volcanic, in my model in reality is continental debris that once belonged the eastern coast of Africa, resp. the western coast of North America ( some of it even found in the Rocky Mountains ), and the islands south - east of Bali to the eastern coast of Australia resp. the western coast of South America. I do not know if there is a marked difference geologically in those two parts of the Indonesian island range, but there is a marked biological divide between the Islands of Bali and Lombok. This biological separation between the Asian and the Australian fauna was discovered by Alfred Wallace in 1856, and was in fact named after him. The "Wallace Line", which necessarily runs the whole breadth the Indonesian island empire, indicates a long separation between the two parts, which off-hand look like they have always belonged together; but the strait between them is between 400 and 1500 meters deep and is termed an oceanic "graben". To put it even more bluntly: the surface of this planet has but two true subduction zones; southern Eurasia and western America. And I am not even sure if they cannot be counted as one, maybe excepting the branch to New Zealand. All have traveled far, but not as far as Africa itself; although this is difficult to state, considering it is a round trip; and more than once Africa will be or has been, like the moon sailing around the world, in the place it started from. The eastern flow then is not weak, but very strong. 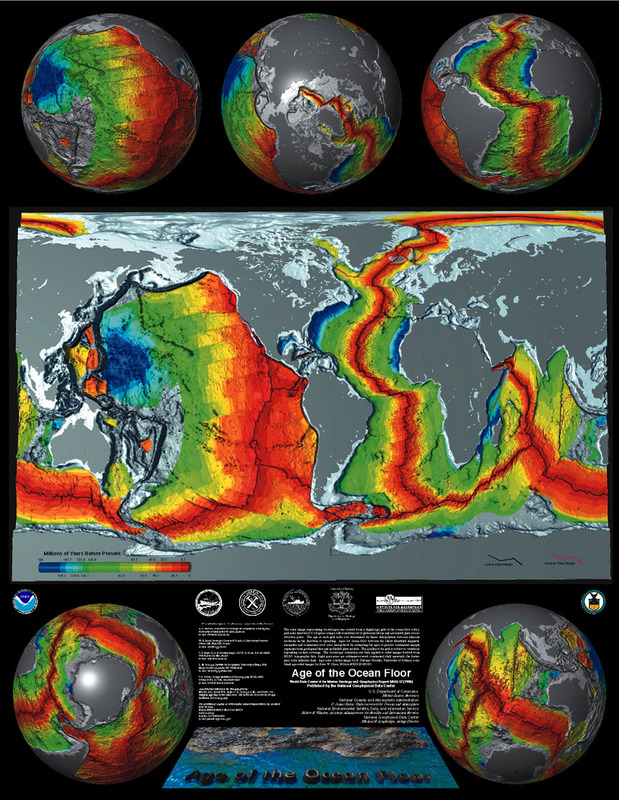 Note the black mid-ocean ridges; these are the planetary tectonic spreading zones, while the bright- orange continental mountain ranges are the subduction zones being compressed. Note also the triangular connection of the spreading zones and the location of the new, alpide mountain ranges towards the west and north; these are important. The mid-ocean ridges are always the most newly-formed crust on this planet, corresponding with the age of the thereby compressed alpide mountain ranges. To rewind the continental drift backwards through time, the mid-ocean ridge area is reduced step by step, and the alpide mountain ranges spread out accordingly. The result is that the continents have now moved west. The triangular connections of the spreading zones enforce this, together with the location of the alpide mountain ranges. Alas, the size of the continents is greatly exaggerated in this rather rough animation; but the result is an elongated form of Pangea reaching over the poles. We shall now wind the continental drift forward again by re-spreading of the ocean floor and re-compressing the alpide mountain ranges. The result is that the continents have move east during the continental drift. This is because the core of the earth is rotating faster than its surface, dragging the continents and ocean floor along with it towards the east. And perhaps compare it with the animation found here. There are quite a few similarities. If there is any one out there who would like to try to work this out directly as a proper Flash TM animation ( using, for instance, this picture ), go ahead! I would be most glad to publish any results on this page. Please contact me. I also believe that the moon , for similar reasons, must have a displaced center of gravity facing earth, being part of a spiraling gravitational system that has its center in the earth's core ( and this indeed seems to be the case ). See also nature.com for an idea on how thin the earth's crust really is, compared with it's massive interior; and how mountain chains, though the may seem high to us, and indeed have their peaks almost up in the stratosphere, they are but shallow crumples that can easily be formed by the huge forces that hold this planet in it's path. Furthermore: The earth's atmosphere may in prehistoric times have had 2-3 times the volume, pressure and density of today, enabling bigger and heavier creatures to breathe and fly ( dinosaurs, pterodactyls and before that, gigantic insects and other arthropods), as well as forming a different climate. Maybe even allowing for higher mountains by elevating the erosion levels. More details to that point can be found here. If this was so, why and how has the earth's atmosphere disappeared? And is this still going on? At what rate? As it seems, while I was wrestling with plate tectonics and found that the solution to the observed problems could really only be found in a postulated superrotation of the earth's core, Paul Richards and Xiaodong Song from Lamont-Doherty had concluded from analyzing seismic waves from earthquakes that the earth's core must be rotating faster than the surface. And now this seems to have been confirmed by new research which apparently hit the news in the August 26 issue of the journal Science, 2005. The inner core has a diameter about three-quarters that of the moon, and a mass about 30 per cent greater than the mass of the moon. This inner core rotates in the same direction as the earth, but seemingly completes its once-a-day rotation a little bit quicker than the planet as a whole. The studies also indicate that the fast-track axis is not exactly north-south but is tilted slightly at about 10 degrees from the earth's own axis and moves eastward. Over the years, it would trace a circular path around the north pole. The so-called "superrotation" of the inner core is of the order of 0.3 degrees to 0.5 degrees each year. This means that in about 900 years the inner core would gain one full rotation on the rest of the planet, which would be about 50,000 times that of plate tectonic motion. 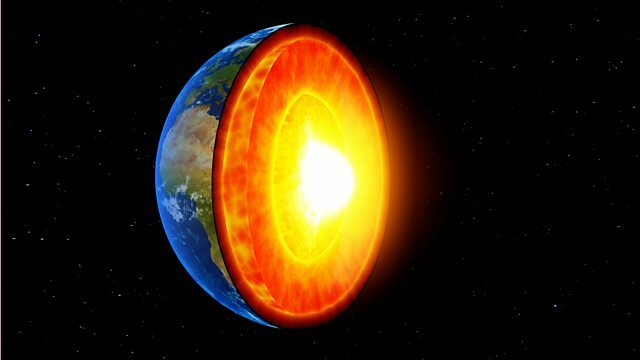 Does this really mean that the core of the earth is moving 50,000 times faster than the surface? In 900 years, which are 900 x 365 or roughly 300,000 days or planetary rotations, the core completes 1 extra rotation, giving it 1,000003 times the speed of the planetary surface on the equator line. Or 20,000 extra rotations during the 20-odd million years it took that part of Africa once to become India and Tibet to be dragged across the Indian Ocean and rammed into central Asia. Now that it seems established that there IS a superrotation of the earth's core, as I had postulated some time last century, maybe someone will be able to measure its influence on the earth's surface. As far as I know, this has not yet been recognised as a possible motor for the continental drift. One down, one to go. The sad catastrophe of the earthquake and tsunami that hit the main island of Japan on March 11, 2011 seems to have moved parts of the east coast of that country eastwards by some 3-4 meters, expanding the country, and parts of the ocean floor to the east of it by as much as 20 meters. Yes, that can be explained by a rebound effect. And yes, there is a subduction zone. Perhaps, though, Asia, and with it Japan, is being carried, pushed and torn ( south - ) eastwards, the effect being more marked the further east you go, opening the Sea of Japan basin, not closing it. The similar would apply to Australia and New Zealand. Such would be the rather dramatic consequence of this idea. Addendum 2015: My Stars! Is it that late already. look for "Images", especially this one ! then try to reduce the ocean floor in reverse according to its age! 1) This would be an effect of the interaction of gravity and centrifugal force ( leaving out the effects of dark matter on galaxies ). Precise measurements by satellites seem to show that the earth is bulged out slightly at the North Pole, while being indented slightly at the South Pole. This, if correct, gives the earth a somewhat pear-shaped appearance. This could be a sign of material being transported from one pole to the other, probably from South to North Pole via the core. Lutz, T.M., and K.A. Foland 1987, Meridional pattern of the oceanic rift system. Busse, F.H., and C.R. Carrigan 1976, Laboratory simulation of thermal convection in rotating planets and stars. Kane, Martin F. 1972, Rotational inertia of continents: proposed link between polar wandering and plate tectonics.
. . . sowie die Arbeit von Albin Fischer * über die Entwicklung des Klimas seit der Eiszeit - zum ersten Mal on-line! * Ich mache hier aufmerksam auf die Arbeit von Herrn Albin Fischer, Kassel, zur Klimaentwicklung seit der Eiszeit und sein schönes Poster, veröffentlicht im Orion - Verlag, Bärenreiter - Druck, Buchhandlung Lometsch, Kassel, ISBN 3-9800751-0-9, welches ich auf dieser Seite teilweise eingescannt habe. Sept. 1997 - Sept. 2002 before it sadly had to be abandoned.